We are delighted to be hosting our first open day on Sunday 15th September. In the Moment will open its doors to friends old and new for free taster sessions! In The moment teachers will be on hand to answer your questions as well as teaching fantastic free movement and wellbeing sessions. throughout the day. 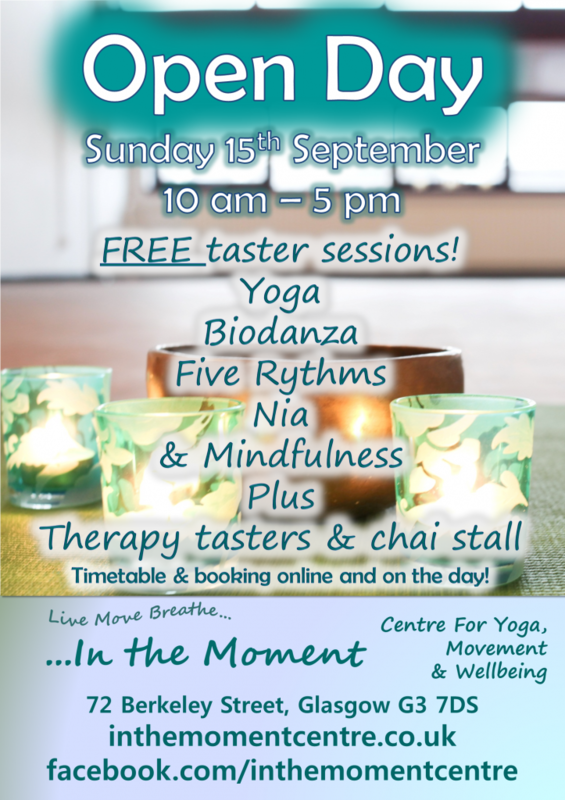 We have sessions in Yoga, Biodanza,Five Rhythms, Nia and Mindfulness. All free for you to try. In addition, we will have a chai stall where you can buy authentic Indian chai, herbal tea and healthy(ish) sweet treats. We are also offering 20 minute therapy tasters for only £8.